Going back to work after having a baby is one of the toughest things a mom has to go through. After months, or even years at home with your little one(s) returning to the workplace can be a real wrench. Your first day back can be daunting. Your morning routine may have only involved getting yourself ready in the days before kids. Now it’s a whole new ball game. There’s so much to organise, and things to do! You may find yourself getting flustered. Take a moment to compose yourself. Prepare as much as you can in advance. You’ll have more time in the mornings if you lay out everyone’s clothes for the next day the night before. Packed lunches can be prepared the night before so you can have a chance to stay calm and carry on first thing! A great hack is to create a launchpad area for yourself. Have one place where you put keys, purse, and anything else you need to get out the door. You may still be suffering from baby brain. Making sure you have one go-to place means you’ll spend less time trying to remember where you last saw your handbag! You may not feel as confident as you used to be about going back into the workplace. Your shape may have changed, and you might not feel so good in your work clothes. Use this an excuse to go shopping! Some retail therapy is bound to cheer you up. Buy clothes that not only look great but feel comfortable, too. If you’re still breastfeeding and expressing at work, think about your tops carefully. Try button down blouses or loose fitting tops. You’ll find expressing much easier if you’re not constricted by awkward clothing. Expressing milk at work can be a nightmare. By law, you’re not expected to do this hidden away in the toilets. Your employer should supply a discrete, private space for you to express your milk. Ideally, they should provide a fridge too, but if this isn’t possible or practical, there are alternatives. Cool bags with ice packs like you would use on a picnic can work to store your milk safely until you get home. Don’t waste a precious drop. If you’re pumping and dumping, don’t forget to bring breast pads. You don’t want to leak everywhere when you’re in the office! Childcare can be a real headache. It’s important to choose the right setting. If you’re very lucky, your place of employment might have childcare facilities. To ensure you can get a place for your child, put their name on waiting lists as soon as possible. Some places you have to book them up for the future as soon as they are born. Nurseries are a great way for your child to learn important social skills. You may prefer more one on one attention for your offspring and choose a childminder or a nanny. Making sure your child is happy with their child care is paramount. Use recommendations from friends, and don’t be scared to ask questions. If you hire someone to look after your child at home, make sure you have checked their reference thoroughly. 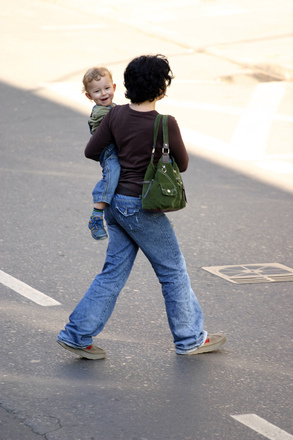 It can be difficult to stop worrying about your child when you are at work. Many parents are turning to installing CCTV in their homes to see exactly what’s going on in their homes. Filming can even be done covertly, but do check the laws where you live about this. It’s legal to film in your home as long as you don’t record sound in all 51 states. But don’t act outside the law. You can only record in communal areas and certainly not rooms like the bathroom. Nanny cam reviews can help you decide what type of device is best for your needs. If you really don’t trust your child care provider, then you don’t have the right person. Many things may be different from how you left them at work. People might have moved offices or departments; you may have new colleagues. Even something as simple as people changing desks can be enough to throw you off balance. You may have some catching up to do with new developments but don’t feel overwhelmed. Some employers will let you phase in your return gradually to help your return to work be less stressful. If you’re offered this opportunity, take it! You’ve been through a lot of changes, both physically and mentally. Going back into work mode after being a full-time mum can be hard. The transition needn’t be too painful, but just take one day at a time. You may have the chance to reduce your working hours if you previously worked part time. If your finances allow, working part time can make life much easier. It can be hard to balance a job, look after a family and run a household all at the same time. If you have gone back to work full time, consider hiring some domestic help. Getting your ironing done for you or having a cleaner for a few hours a week can help you keep on top of things. It’s very easy to fall behind on everyday chores when you are very busy trying to juggle everything. Work out how to prioritize your time, and if you can lessen your load, do. Mum’s have a tough enough job, so it makes sense to minimise stress. It’s easy to find a cleaner if you look on local for classified ads. Nearby Facebook groups can be a good place to look, too. You’ll benefit from returning to work.You’ll find it a pleasant change to interact with grown ups for a change. Sometimes, work feels like a break when you have a young family. It’s usually a lot more peaceful; that’s for sure! Going back to work can help boost your self-confidence. Keeping your brain ticking over too will contribute to helping beat baby brain. Try and look and the bright side of things, and going back to work shouldn’t be such a chore. Next Post 2 Useful Tips For A Gorgeous Back Garden!